Still Alive: The Remixes & The Xbox 360 Game! Are you on the edge yet? Tracksounds is proud to offer you a chance to win the special remix release of LISA MISKOVSKY's "STILL ALIVE" - the title song from one of the top rated games of 2008! Four lucky winners will be chosen by random drawing for this special 6 track release which features remixes by: Junky XL, Benny & Alle Benassi, Paul Van Dyk and more! 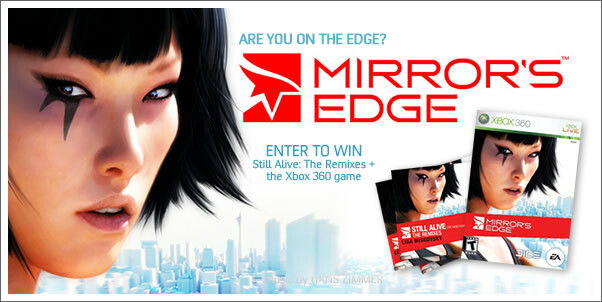 One lucky winner will receive the GRAND PRIZE which includes both the "Still Alive" Remix CD and also the MIRROR'S EDGE game for the Xbox 360! Entering to win couldn't be easier. Simply fill out and submit the form below. All winners will be chosen at random and will be announced here and contacted by email to obtain shipping information. This Contest will close on January 2, 2008.